A Cheap, Easy DIY Option to Keep Your Home and Family Safe. Monitoring your home is important, but not everyone can afford the high prices of security software and equipments. How to Use Manything App? The Manything Mobile app (Android, iOS ) is a cheaper way to have home security at a lower price or even free. To use Manything, all you need is an old smartphone or tablet. Simply install Manything App on your (Android/iOS) spare device, select “Camera” mode and press record. Then download Manything to your main phone or tablet which you carry with you and select “Viewer“. It’s that simple, now you can watch your camera from anywhere! 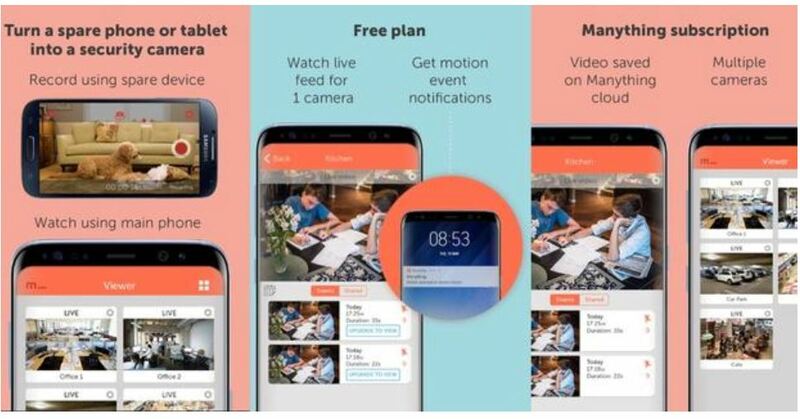 The free plan, you can use Manything on 1 camera – you can receive motion/sound alerts and watch your camera live streams! Want to use more than 1 device, watch past video events and save video to the Manything cloud? Upgrade to one of monthly subscription plans from just £2.99 a month. ← How to Get the Location of Someone whose Phone is OFF or Offline?